Have you ever played a game so excruciatingly terrible it made you want to cut off your hands, burn out your eyes, and give yourself a partial frontal lobotomy to try and remove any trace of how terrible it was from your brain because just the thought of it would make your blood boil with murderous rage? Before this week I didn’t even know that feeling existed but now, as I sit here writing these words, I can feel myself developing an unquenchable bloodlust from the mere memory of this steaming pile of garbage. Touted by many critics as the best wrestling game to date I have to admit maybe my expectations were set a little too high – though after last years game which felt like there was finally progress being made for the franchise for the first time since the switch from PS1 to PS2 – nothing could adequately prepare me for the disjointed, block headed, unresponsive, glitch-filled festival of shame that I was about to endure. 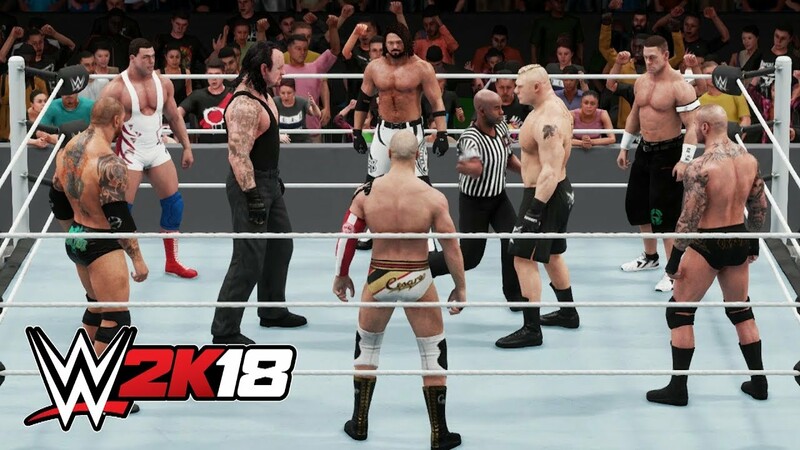 8 person matches were now a thing, and with a roster of over 170 people (many of which are included for the first time) it seemed like the only logical thing to do was try it out – a decision I would later come to regret. 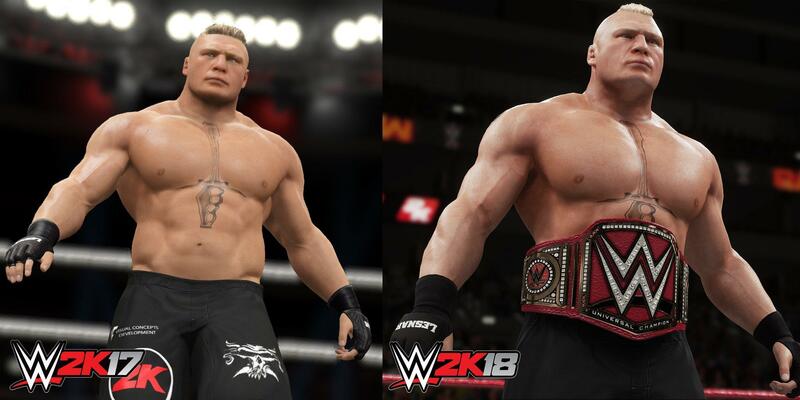 Graphics comparison between 2K17 and 2K18 – so far, so good… Wait, what? Firstly, the animation of the wrestlers was awful. My entire team were doing the same things on the apron, pulling the same poses and at one point after a double team all three of them were along one side of the ring and I couldn’t tag them. But hey, you can’t win them all, and I just figured it would get better. It didn’t. After beating the other team senseless I made no less than 3 attempts to end the match where there was a pin attempt for 10 seconds or more that the referee never counted – by the time he eventually started the cover was broken or the opponent kicked out and I had to start again. Alright, this is a little glitch, it’s no big deal this will get better. It didn’t. On no less than 3 occasions, and for no apparent reason, my characters turned into what I can best describe as “rubber spaghetti men” contorting and twisting at unnatural angles, at one stage Bobby Roode even bent in half backwards, but it’s a new engine and I just figured it would get better. It didn’t. As the match went on for some reason that is still beyond me Rich Swann disappeared through the mat and got stuck half in half out while vibrating around in a circle until he was eventually picked up by an opponent. At this point I don’t even need to say what I was thinking about it improving. It didn’t. After over half an hour of disjointed, glitch riddled game play – including this nifty new feature where I got caught in between two opponents and kept auto targeting them repeatedly while getting beat on by the other one – and a seemingly never ending match because the referee wouldn’t count I finally lost. This only occurred, however, when Samoa Joe went for the Coquina Clutch, Bobby Roode got tangled in the ropes, did a spaghetti man bend, and then submitted without even being held on to. Yes, I know wrestling is fake, but that was taking the piss even by my standards. After this match I turned the game off and swore never to play it again. 8 people in a ring is like communism. In theory great, in practice terrible. I lasted until the following day. Waking up with a new attitude and a new outlook on life I thought to myself it’s a new game, it will take some getting used to, it will surely get better. It didn’t. Going against everything my brain told me I decided to give it another chance, this time in the MyCareer mode, where you make your own superstar and work your way up from prospect to big time guy (I assume, if you can manage to play the game that long). For the first time since Smackdown: Shut Your Mouth on the PS2 the player is able to walk around backstage and interact with other people on the show. I thought that this feature might bring back some nostalgias and make the game more three dimensional. It didn’t. Instead it made even the simplest of tasks time consuming and laborious. Like previous years titles you are introduced to the regular gameplay in the performance centre and you are forced to compete in a series of tutorials. Unlike previous years where this happened all at once this year had the added feature of completing a tutorial, then loading out to walk around and talk to the guy who just gave you the tutorial, loading back in, and doing the next one. After an hour of tutorials, and a squash trial match because you just need to be reminded you are a lowly peon, eventually I graduated to the arena and I was going to be on an actual wrestling a show. On arrival I had to find the Stage Manager and talk to him, he pointed me in the direction of a whiteboard, I had to go and find it, I had to choose my activity for the week – which was to cut a promo – and that was that. All in all my TV debut was pretty good apart from the crowd chanting some random phrases at me for no apparent reason and the 5 loading screens I had to wait through. Despite having to run all the way out of the arena and out to the carpark where I had to find the security guy who would let me leave and advance to the next week it seemed like it was going to get better. It didn’t. And when I say it didn’t I mean that what transpired in my second week was the single most infuriating thing that I have ever experienced. My second week started off as I loaded in next to the parking lot guy, then I had to run all the way through the parking lot, to the arena, and then all the way through the arena to the Stage Manager. He put me to work in my first proper match. Sort of. First I had to sit through another of the games excruciatingly long loading sequences, which I couldn’t skip, I arrived in the arena and was greeted by Michael Cole saying the same thing he said last week – Orlando is the resort city in case you forgot – then the brief cutscene ended and I went back into another loading screen. So I waited and it loaded. I made my entrance, my opponent made his, finally after 2 hours of tutorials and backstage shenanigans and running too and from the parking lot I was going to play the game properly. The match started, I took my opponent down with a strike attack, and then it went to a cutscene. Bobby Roode came out and attacked me and the match was over. To say I was annoyed at this point was probably an understatement as I could feel the controller starting to crack in my hands as I squeezed it with rage and just like that week two was over. Well, almost, but first I had to sit through another loading screen to load back to the backstage area where the stage manager told me that “things like that sometimes happen” and then had to run all the way back through the arena, back through the car park, back to the security guy and then sit through another load screen to load out. At this point I’d had enough and not even the mystery of what might happen in week 3 could force me to keep it on any longer. I turned the PlayStation off, switched off the TV, and sat in silence listening to the little voices in my brain urging me to snap the disc – sadly a request I couldn’t even afford them because the game was purchased digitally, though if it hadn’t have been god only knows what would have happened. All things considered, after some 20 odd years of gaming, this was the single worst game I have ever played. I can’t even think of another game which comes close to how bad this was, especially for the amount of hype which surrounded it upon release. The graphics are average, the gameplay is awful and the only thing I could give it a 10/10 for is loading screens – and that’s not because they are good it’s just because you have to sit through 10/10 before anything will actually work. If this game were the answer to a high school equivalency quiz at the end of a movie I would award it no points and may god have mercy on its soul. I agree with the issues you mention like the huge amount of loading screens and some glitches, but I’ve enjoyed it a lot. Not the worst game but not the best either. It’s obvious they developed for Pro consoles and downgraded, should be the other way IMO. Seems you all you described occurred without patch 1.03, even though I’ve only seen one glitch during my game play, a spaghetti issue while roaming which I fixed immediately after going to the menu and back (Options on PS4). None of the other errors people keep crying about I haven’t experienced either. Since writing this I’ve seen and read the details from the latest patch and I’m hopeful that it will address the majority of problems I experienced – although I wouldn’t have minded the prospect of intergender capabilities but that’s another story for another day. I will leave it to cool off for a few days and will give it another crack no doubt, probably next week, and hopefully my opinion will change because as I said I was really looking forward to it before I bought it. I guess I have been ‘blessed’ with not much time to play and run into bugs. I enjoy more universe since there’s no so much loading screens. I guess the free roaming has its price. Also noticed that that first load in career to just show the crowd is not on other modes. Probably not needed. Don’t forget that every single year when the latest WWE game is released, people always complain, and that for me really hurts the very vibe that video-games used to bring to the masses as a fun hobby. As for me, I’m waiting until Christmas Day to play it, and I am confident that a big chunk of the problems will be fixed, because I Bo-lieve! Since writing this I have grown to appreciate the game more – mainly because it almost drove my machine to the point of no return. I have since taken it apart, serviced it and thoroughly cleaned out 5 years worth of dust which I had been putting off for, well 5 years. Ever since that service the heat censors and fans have been much more reliable. I also moved the game onto an aftermarket hard drive which seems to run a little bit faster than the stock PS4 one which I would also recommend. As for the gameplay it has gotten consistently better with each patch so I have no doubt that you will enjoy it, I just hope your internet connection is better than mine and it doesn’t take you 12 hours to get the updates!